This one worked better, yet it seemed too chunky. After this one, the entire series stayed in suspension until I recently uncovered the sketches in a box of misc art supplies! I visualized a Guava tree with its sturdy antler-like limbs as a model, but the Ceibo trees spoke loudest. They personify a highly-intelligent being, capable of the entire range of emotions and the ablility to pull up roots and dash for safety! There are many ways to tune out distractions. I’ve been drawing and painting for so long, that all it takes is to pick up pencil or paint brush, and in about five minutes, I am oblivious to the rest of the world. Simple drawing exercises can help warm up the creative side of the brain, but there are other options. Adrien Mauduit’s time-lapse video of Denmark’s stunning night sky has the power to cast a hypnotic spell on the viewer. It put me into such a peaceful state that I selected ‘replay’ to prolong the magical spell! To know more about the video, go to his website post March: A Night Sky full of Wonders. The tree theme is strong this week, and a very special story came out on the same day as In Celebration of Trees. Enjoy this post: The Man Who Died & Came Back to Plant Trees. 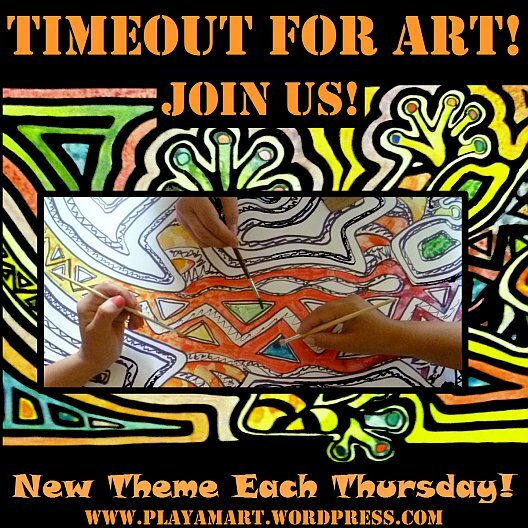 Next week’s Timeout for Art will show how “The Tree” takes control of its destiny! Beautifully done — and said! Thank you, Hugh. You have some impressive trees in your yard, if I remember correctly from a photo of a snow-covered landscape from years ago.. Thanks for the Great memories and FUN you reminded me of…… And to think one year has already passed….my how time does fly……Beautiful post as always Lisa. Hugs from Panama ….BB aka Hummingbird…aka Barbara…..waiting for next round! thankyou hummingbird! yes, it’s been a year.. too bad one cannot travel via ‘zip tube’ — wouldn’t that be fun?! Lisa.. So so loved your post.. and you know how much I love Trees.. Your theme is one I love.. and so enjoyed.. Seeing the visuals of your creations and that of Barbara’s and the humour that you injected into some of them. I love the creation of the Tree, John Muir was such a passionate advocate for Nature and the environment.. I loved your painting you created for the coffee shop.. 🙂 And your older sketch just stunning.. Love the faces you drew in the real photo’s too.. The idea you have for the tree with the quote. yes, it’s a joy to paint and dote on the trees, and you give them the same respect and praise as i… painting or drawing trees is never work – it’s calming and connects me back to mother earth – even if i’m surrounded by ‘urban’ landscape! Thanks Z. Love the 2 Can humor. Your tree drawings are wonderful. Thank you Emilie! Trees deserve as much attention as possible! I just love the way you decorated the trail! Thanks, Otto. Trees have such strong character – or they can appear weak as well… or sickened… there are many people who don’t notice, however. I might be going to the Napo River next month… it wil be wonderful to see the beginnings of the Amazon…. thank you Gwen! Yes, the ‘2 cans’ was a fun and nostalgic one to create! So much colour, joy and humour!!! Beautifully written post! Hugs! Really enjoyed this post, Lisa. Loved the night sky video, and the Two Cans joke. John Muir, I’m sure, would approve! Thank you! Yes, that night sky video is very calming, but I also wished someone was nearby who could answer, ‘what was that?’ and ‘is it normal to see so many meteors at this time of year?’ etc etc..
may you have a lovely weekend as well! will you be playing music – for the public’s benefit – this weekend? Such a happy post Lisa – cheerful paintings that brings smiles to everyone who see’s your work. The coffee shop painting is fantastic, as are the other. Loved seeing Barbara’s smile again and the path, well awesome that you’ve created a pathway to explore (I would have loved to work on it). Your drawing at the top of the tree – brilliantly executed. the header image was made with a computer program.. just one ‘convert’ selection and it took a magnificent tree and broke it down into equally brilliant black and white… i can’t remember the name of the program, and i a away from my ‘big’ computer…. Interesting Lisa – yesterday my husband and I went for a walk in a wooded park not to far from where we live. It’s the trees that draw us to the area, as a matter of fact a drawing I’m doing now is of a scene in that park with a prominent tree becoming the focus. Some of the trees in this park have to be a hundred years old, if not older – huge, with very large limbs . I read your description in what I saw. I think one has to truly love and study trees before they can appreciate those amazing traits. The guava trees here are in the crepe myrtle family, and the mature ones look just like crepe myrtlles, only without showy blossoms. Their strong trucks and twisted branches present such power..
Great question – Crepe myrtles are beautiful, but I have to say the more I see and study Live Oaks, the more they have become a favorite of mine. Although Birches and Aspens are beautiful too. Oh and I forgot Japanese Maples especially in the Spring and Fall around here. Okay to tell the truth many trees appeal to me . . . what about you? What is your favorite? From one lover of trees to another! Yes, it’s hard to pick a favorite.. Down here we have such ‘classic rain trees’ which are the saman and the guanacaste.. but then there are ceibos and ceibas… and those gorgeous guavas… and the ‘royal poinciana/flambouyant trees burst into bloom – oh,what a visual treat! I always love seeing photos of the oaks with their sprawling branches… and those swampy cypress trees… the delicate dogwods in bloom.. we could probably sit up all night just naming beautiful trees.. and the next night doing the same with flowers! I was especially intrigued by your third and fourth sketches. The chalice-like shape of the tree suggests so many things: all of the things that a tree holds, and also the pouring of libation — an offering back to the earth from one of earth’s most cherished creatures. And of course, in the Christian traditions, the lifting up of the chalice is an especially potent symbol. Lifting up the tree-cups is something you do beautifully. Thank you! color does manage to liven up the area and those who experience its effect!